Green biotechnology is one of the most promising areas of research of the 21st century. Crops are regarded as biocatalysts for the future. Increased yield, better resistance to diseases and drought, but also the economical and sustainable production of added-value products such as flavoring and active ingredients, purely from sunlight and carbon dioxide move into the focus of research and development worldwide. 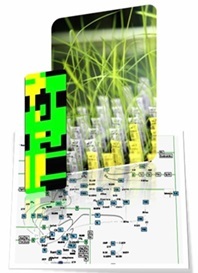 As a prerequisite towards efficient design and breeding of customized plant lines, we develop novel approaches for systems-level characterization of plant cells cooperation with BASF Plant Science and its subsidiary Metanomics. Beckers, V, Dersch, LM, Lotz, K, Melzer, G, Bläsing, OE, Fuchs, R, Ehrhardt, T, Wittmann, C (2016) In silico metabolic network analysis of Arabidopsis leaves. BMC Syst. Biol. 10:102. Link. Dersch L, Beckers V, Rasch D, Melzer G, Bolten CJ, Kiep K, Becker H, Blaesing H, Fuchs R, Ehrhardt T, Wittmann C (2016) Novel approach for high-throughput metabolic screening of whole plants by stable isotopes. Plant Physiol. 171:25-41. Link. Dersch LM, Beckers V, Wittmann C (2016) Green pathways: Metabolic network analysis of plant systems. Metab. Eng. 34:1-24. Link.